The Rapid Reel is a lightweight, refillable wire dispensing unit. The Rapid Reel is a lightweight, refillable wire dispensing unit designed to be worn in conjunction with the Reelfix belt and comfort pad. Refill spools are locked in the reel by a quarter turn knob. Empty spools can be replaced in less than 20 seconds and without the need for the user to remove his/her belt. For safety reasons, our reel features belt loops on the rear. This ensures that unlike other reels, Reelfix cannot fall off if bumped or caught on scaffold for example. No other reel works as well as the Rapid. That’s why it’s No1 with the Steel Fixers and Safety Advisors. Refill spools are locked in the reel by a quarter turn knob. 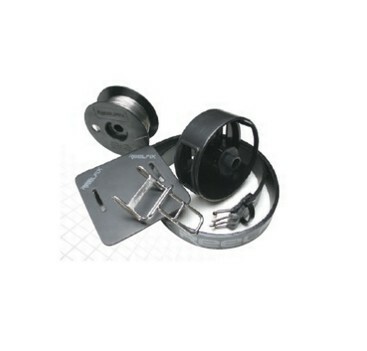 Empty spools can be replaced in less than 20 seconds and without the need for the user to remove his/her belt.